For the second year, Richmond Black Restaurant Experience has animated the city, drawing attention to over 30 Black-owned restaurants from soul-food favorite Mama J’s to the craft cocktail-focused Minibar. From the mobile soul food truck festival in Abner Clay Park, for which the Black History Museum opened its doors at a discounted rate, trap yoga at bareSOUL, The Basement at the Vagabond, and the culminating Stick A Fork In It festival, over 130 businesses participated in addition to the 30 featured restaurants. The Stick A Fork In It festival featured chefs and caterers selling $3 to $5 plates, demonstrations and a cooking competition, and live sets from the Legacy Band and DJ Lonnie B. One of many success stories from the expanded Black Restaurant Experience is reflected in Keva Miller, a chef and business owner who won best caterer at Stick A Fork In It. A few months earlier, I’d gone to Manchester Friday Fridays to see her cooking demonstration. We’d met a little over a year before and I wanted to support, especially as I noticed she was more consistently giving demonstrations and hosting events. She was doing a lot of work towards getting her catering license so she could cater larger events and do demonstrations for even larger crowds. Fast forward five months and she’s on stage at Stick a Fork In It after a day of prepping in her shared commercial kitchen space. In a crop top branded with her company name, FeedShine, and joggers, she guided the audience through a demonstration of her massaged kale technique. 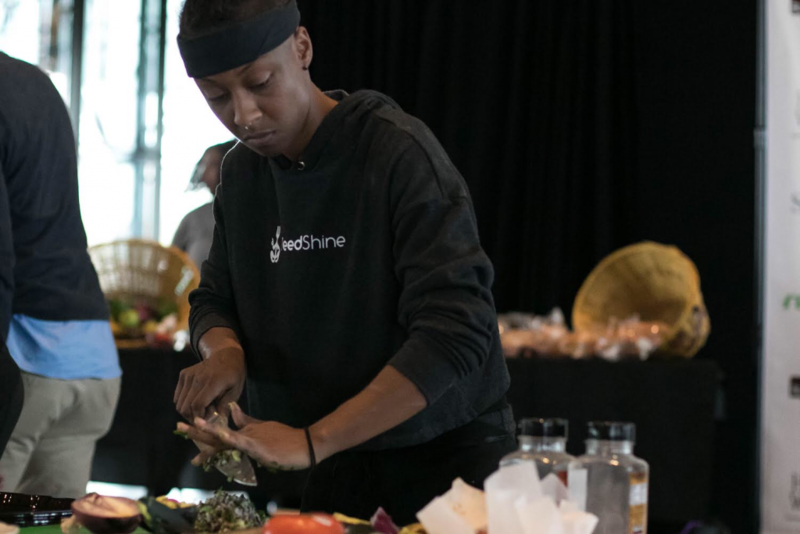 “Feedshine is a holistic lifestyle company that I started to be a one-stop shop for self-actualization, which is just a very complicated term for finding yourself,” said Miller of her catering and private chef service company. She tells the story at every event with celebrity reflection. After undergrad, she had everything she needed and was living good working as a food service rep for Pepsi. Equipped with a company car, she went around to local chains as far north as Dale City and as far west as Goochland/Emporia convincing them to endorse Pepsi as their soda carrier. She came into the position with 1,200 customers and her job for the next three years was maintaining and getting more customers. In her final years with the company, she became painfully aware of internal work that she needed to do. On top of her phone ringing from 8 am until 8 pm, the constant hassle of connecting maintenance people to delivery guys at plants, meeting with prospects and ensuring that client accounts were secured before their business doors opened, she was fatigued by depression and just slept when she wasn’t at work. She was skipping breakfast and eating poorly. Things changed when she started having a little fun in the produce section. 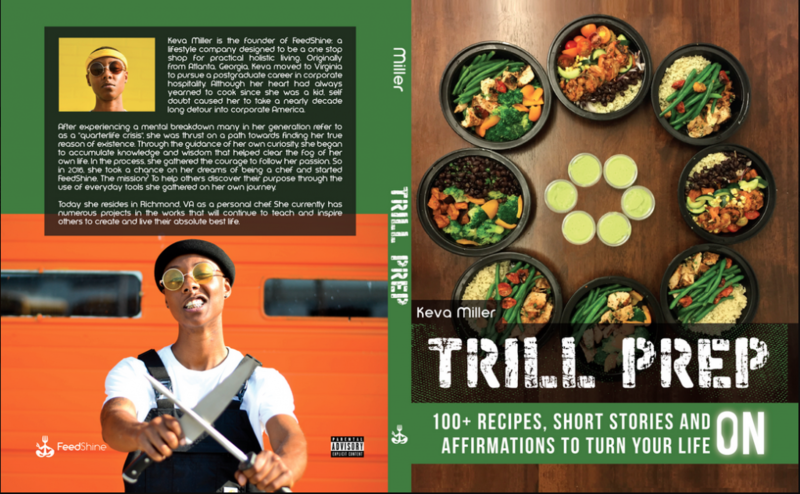 The experience led to her cookbook, Trill Prep, which features over 100 recipes, affirmations and personal stories. It’s intended for people going through the same experience, transitioning towards healthier eating, so there is a mix of chicken, seafood, and plant-based recipes. For Miller, writing the cookbook was about telling her story and giving people the kind of guide she wished she had. For Miller, it was a dream come true. “Then at the end of it, for me to win the overall [best] caterer when I just got my catering license in January, it was great,’ she said. 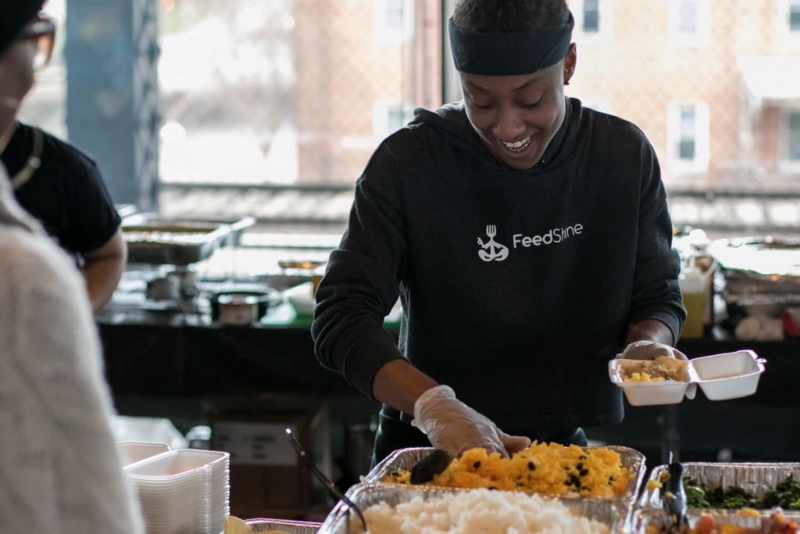 FeedShine was placed between Minibar, headed by Executive Chef Micah Crump, and Shawanda Harrison of Holistic Alaye, two vendors dear to Miller. For Miller, the Experience was a way to introduce people to food they may not typically opt for when dining out. “It was great. I just love seeing us both ascend to new heights doing what we love and giving people this vegan food that a lot of times some people might turn their noses up to, might not be feeling it, “ Miller said. During Black Restaurant Week, Miller catered FeastRVA and hosted her first private tasting at The Broken Tulip, two items on her bucket list as a chef. Next, she’s conquering another long-term goal by hosting The Plant Bass’d Brunch, Richmond’s first plant-based brunch, for an event at Vagabond with the Weekend Plans band and DJ Ease. The brunch runs from 12-3 PM at Vagabond on West Broad Street with a day party to follow on May 6. Miller sells her cookbook on her website and uses Instagram to keep in touch with fans at @ChefKeva. Brunch tickets can be purchased in advance via Eventbrite. Cover Photo By: Lechele Trent-Jackson. Other Photos Trevin Curtis. This story was updated to correct the brunch hours and the number of recipes in Miller’s book.